How did it feel to win the Vic Cup Grand Final? Our team’s success is most in part due to how seriously we take Quidditch, even though we have a lot of fun playing, we all have that burning desire to win. I always look forward to playing against new teams each year, which is an opportunity to test against new competition and to make new friends. The underrated star of the manticores would be Mary-Clare [Conheady-Barker], she may be small in stature but she’s tough enough to take on any challenge. Underestimate her at your own peril. The Melbourne Ravens are a new team that formed this year, bringing players from multiple teams together to form a new challenger. It’ll be interesting to watch them at QUAFL. I feel Victoria is home to some of the best Quidditch players in Australia, I feel very lucky to be teammates with some of those players. There’s so much to learn being around all these great players on both sides of the pitch. I’ve learned how far I’ve come as a player since I began and how much harder I need to work if I want to reach the levels of my teammates. One of our biggest achievements how our new players have fitted into our team so seamlessly. It’s a great sense of mateship on the Manticores and how well we all get along. Perhaps the hardest challenge for us was having the team come together consistently. 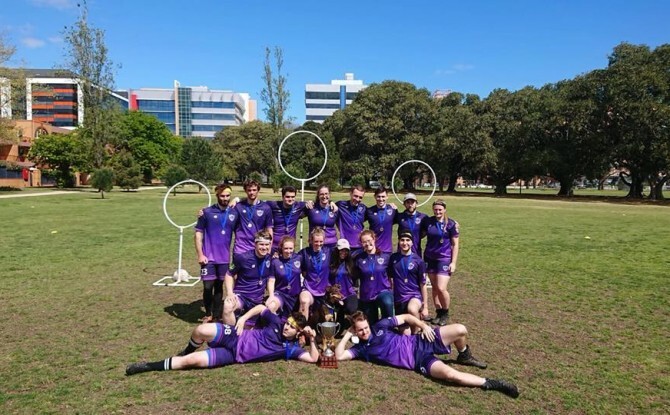 Aside from Quidditch, we all work jobs and it’s hard to weave Quidditch into our work schedule, sometimes we couldn’t get everyone together to have a full training session, have people turning up late because of work or even be undermanned for games. That was perhaps our biggest hurdle to overcome. Once QUAFL is finished, whether we win or lose, our focus will immediately shift to next year, we’ll have our summer break but before you know it, we’ll be back at training with our goal of improving on our previous season.